Technology advances faster than most people can keep up with. The technology in your car is probably out of date before you even drive it off the dealer lot. Unfortunately, most cars cannot get software/firmware updates on their own, like our smartphones and computers. We are stuck with the slow recalls and software updates, if any, that the dealers provide. Sometimes updates even cost extra. I’m looking at you GPS map updates. In part 1 we will explore apps you can use on your smartphone to enrich your driving experience, and best of all they are all free (but may contain ads, offer subscription fees, and/or in-app purchases). Stay tuned for part 2 next week which will look at accessories to upgrade your car technology to the next level. The smartphone has been ubiquitous for many years now and a large majority of people rely on it every day. If you don’t own a smartphone yet, we have you covered there too, check out our Best Affordable Cell Phone Service tech tip. A smartphone is the first step to making your car smarter. It can be your grocery list, navigation system, lifeline in an emergency, and much more. Here are just a few apps that can save you time, money, and help you get to your destination faster. Please don’t talk, text, or use your smartphone directly while driving. Start navigation before you begin your trip and purchase a smartphone car mount. Follow local laws for mobile phone use, for your safety and the safety of everybody around you. Some cars have a GPS system built-in or you may have a dedicated device, like a Garmin. The problem is that these GPS systems are rarely updated and often have outdated maps directing you to businesses that no long exist and have antiquated graphical interfaces. Google Maps is updated regularly, as one of Google’s most popular services, and has access to the latest maps, points of interest, and traffic information with the data connection on your smartphone. Google Maps does have an offline mode but you have to download the maps ahead of time by tapping the three line menu button > Offline areas > plus button > find the location on the map and zooming out or in for the desired map size > Download. For a true offline navigation app, there is Here Maps that can download entire states, not possible with Google Maps. It also allows navigation for those situations when a data connection is not reliable or too expensive. Purchase a windshield mount for your smartphone, to make using GPS navigation safer and more convenient. Nobody likes to pay high gas prices, especially if there is a cheaper price just down the road. 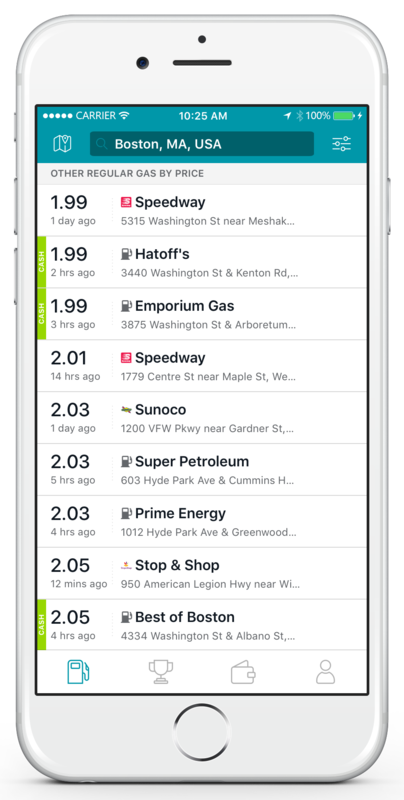 Thankfully, GasBuddy shows the prices of most gas stations around you, sorted by price, distance, or a new smart sort that does a combination of both. The updates come from regular people, like you and me. Since the data provided is crowd-sourced it’s not always up to date, especially if there was a price hike or cut that day, but all other times it generally provides reliable price information. 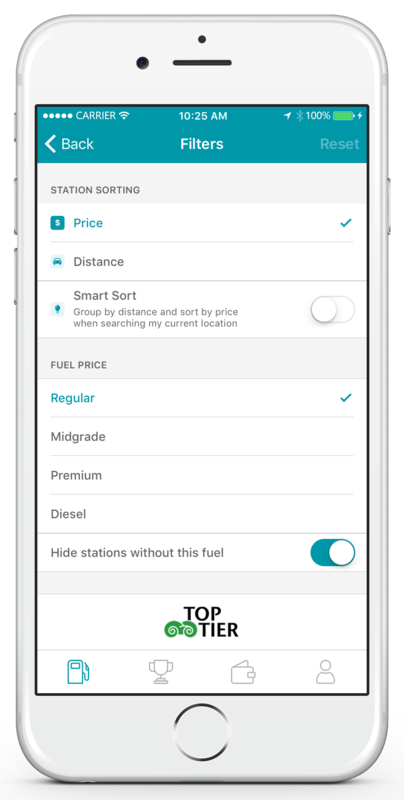 The app was redesigned September 2016 with a cleaner and modern look, adding extra sort features such as by gas station brand or amenities offered at the station. Also, you can view ratings or rate aspects of the station, like the customer service and state of the restrooms, so there are no surprises. 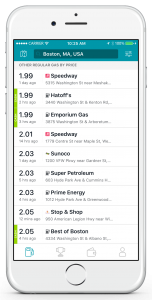 For more details on the changes in the updated GasBuddy app, check out their blog post: Meet the New Gasbuddy App. For music entertainment, without having to worry about downloading or buying each song, there are many streaming services available. The biggest, and arguably the best streaming service, is Spotify. You can listen for free with an ad that plays every 10 minutes, or pay for the Premium plan that removes the ads and has other features at $4.99 per month, for students, or $9.99 per month, for everybody else. You can also get the Premium Family plan for up to 6 people/accounts at $14.99 per month. The advantages of the Premium plan are that it’s ad free, has unlimited skips, you can listen offline and play any track, and it has higher quality audio. Another music service that has been around even longer, is Pandora. Technically Pandora is Internet radio but it functions similar to the free version of Spotify, in that it shuffles music, plays an ad every so often, and offers a limited number of track skips. You can pay for Pandora One that removes the ads at $4.99 per month or $54.89 per year (equal to $4.57 per month), but that’s not worth it compared to what Spotify and other services offer. If you frequently shop on Amazon.com, their Amazon Prime service is a bargain and isn’t only limited to the two-day free shipping it started with in 2005. Amazon Prime includes access to over 1 million songs, and over a dozen other benefits described here. With your UM-Flint email address, you can get a 6 month trial of Amazon Prime for free and after that get it for $49 per year for up to 4 years, a 50% discount off the normal $99 per year. Amazon also has a new service called Amazon Music Unlimited that grants you access to “tens of millions” of songs at $7.99 per month or $79 per year (equal to $6.58 per month) for Prime members, $9.99 per month for non-Prime members, or a family plan for 6 people/accounts at $14.99 per month or $149 per year (equal to $12.42 per month). If you own an Amazon Echo, Echo Dot, or Amazon Tap there is a discounted Amazon Music Unlimited plan for $3.99 per month but you can only play on one device at a time. Whether it’s a trip across the country or just the next town over, Google Trips can help with making it easier to plan. You can research things to do, local restaurants, your ticket reservations, saved locations, and as Google describes “The entire app is available offline” (get more detail at their blog post See more, plan less – try Google Trips). You can have the trips created automatically from your Gmail account or disable that feature by tapping the three line menu button > Settings > turn off slider for Trips from Gmail. Note, if you disable trips from Gmail, reservations cannot be manually entered in the app because it only creates those from an email. Also if the reservation and trip details are sent to another email, you’ll have to forward them to your Gmail for Google Trips to pick them up. Overall it’s a good trip app to research, plan, and navigate on location, especially if you’re not very familiar with the area. Car trip computers or accessories that estimate MPG, are just that, only estimates. 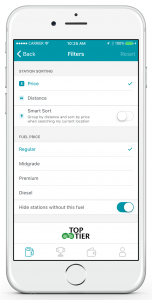 For real world MPG logging, you can use Fuelly. They offer an app for iOS called Gas Tracker by Fuelly and for Android you can use Fuelly.com in the mobile browser. 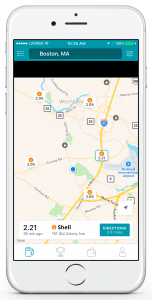 The data you provide is your trip distance, cost per gallon, gallons pumped, percent city driving, fuel octane, data and time, gas station location, and other optional information. You can also use it as a maintenance history tracker but it isn’t as well suited for that use. It takes all the data you enter and puts it in a very readable format. It shows the average MPG, last MPG, best MPG, total miles tracked, percent highway and city driving chart, total logs, total fuel cost, total gallons, fuel efficiency chart, average price per gallon, average fuel-up cost, average price per mile, and fuel-up total cost chart. So to say it gives you a lot of insight and information is an understatement. There are various cloud syncing note apps and they offer a lot of convenience and many features. It’s just personal preference which one you use. Microsoft OneNote is one of the more powerful note apps and the app is supported on almost every platform imaginable. Most versions of OneNote are free, except the desktop version bundled with Office 2016/Office 365, although as a member of UM-Flint you can get that free too through Microsoft. Follow the full instructions at our Quicknote: Office 365 for UM-Flint Students, Faculty, and Staff. For details about the features and ways you can use OneNote, explore Microsoft’s OneNote Blog. Other popular and well-supported note apps include Evernote and Google Keep. All three note apps are cross platform and offer an option to access your notes in a web browser, convenient if you’re away from home and need to access it from a public or friend’s computer. They offer quite a lot of features and make forgetting your notes and lists a thing of the past. Our cars are a huge part of our everyday lives. We use them to get to school, work, the store, family events, holiday parties, vacations, and so on. Why not let technology make the experience a lot better. Your smartphone is so much more than just a phone. With just a few taps you can find the closest hotel or McDonald’s, get turn by turn GPS navigation, have all your notes at your finger tips, listen to music, and the list goes on. Coming next week will be part 2 of the Smarter Car Technology series focusing on accessories. Disclaimer: These recommendations are for information purposes only. ITS does not have any contract or agreement that requires us to recommend any specific app or service. ITS does not provide support for any of these apps directly. Consult the developer with any questions. Please follow any relevant laws regarding mobile phone use while driving. Keep our roads safe, don’t talk or text on your phone while driving.